Inevitably, when you get to your last day of vacation, you try to make the most of it. In my case, I had to scramble a bit to make that happen. However, everything ended up in a wonderful last day. Confession time: I didn’t do enough planning for this trip. Shocker, right? In my defense, I did come in with a solidly large list of things to do when in Amsterdam, and I was able to by and large achieve what I came to do. However, a fair bit of improvisation was needed. As I was grabbing a quick breakfast, I was googling things to do in the city. For better or worse, the more expensive (and thus comprehensive) events would be occurring after I departed. 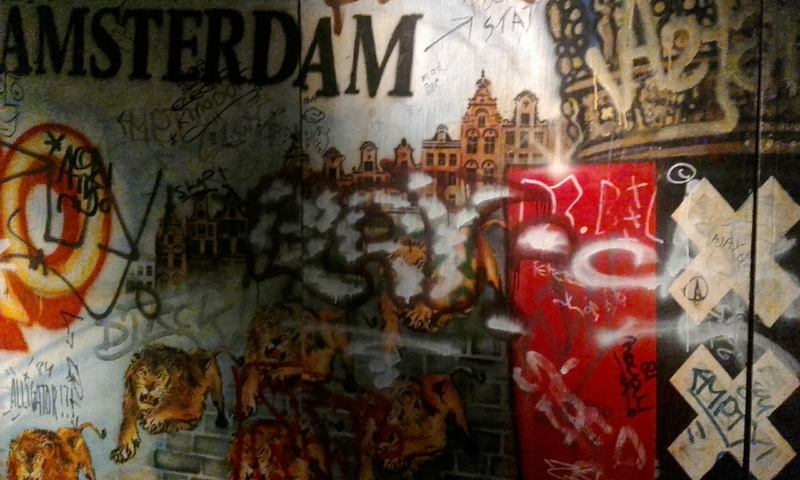 One thing stood out to me, though, and for good reason-the Amsterdam Museum had an exhibition about graffiti. Whoa! Graffiti? At a museum? Naturally, I was curious to check it out. I also had been meaning to check out the museum in general, so this was the extra incentive to go. The museum is tucked away in a side street of the main shopping center, so it was a bit disarming at first. Upon further inspection, however, the property featured a sizable restaurant and outdoor displays. After I bought my ticket, I headed down the tunnel to the exhibition, but I paused to watch a brief time lapse of the city’s boundaries; I’ve always been fascinated with seeing urban transformations of major cities, and this was satisfying. 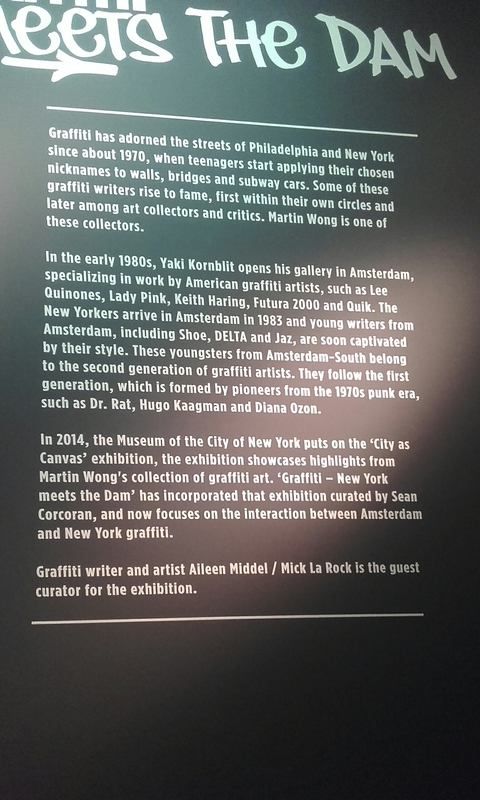 When I got to the exhibition, entitled Graffiti: New York meets The Dam, I was greeted by a sign explaining the significance and meaning of it. Basically, in the 1970’s some bored Dutch youth decided to spice the “boring” streets of Amsterdam with their custom art, which in turn spread to other cities across the Netherlands. 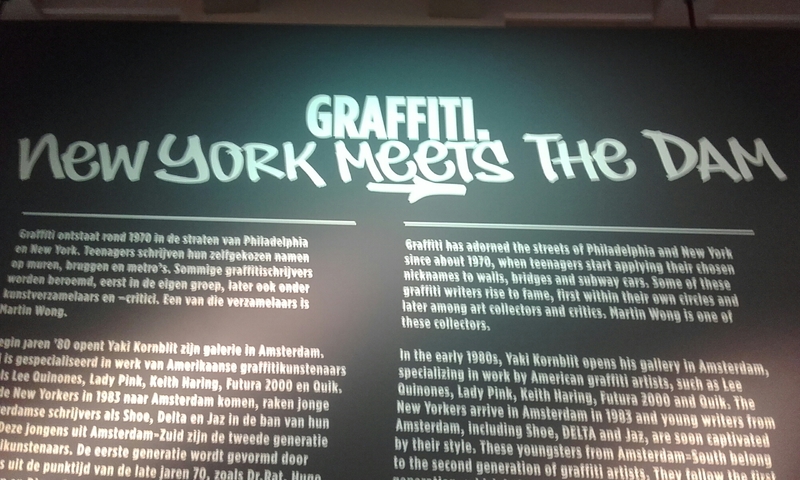 New York was also experiencing a sort of counter culture, and as fate would have it, some artists from the latter would travel to Amsterdam. 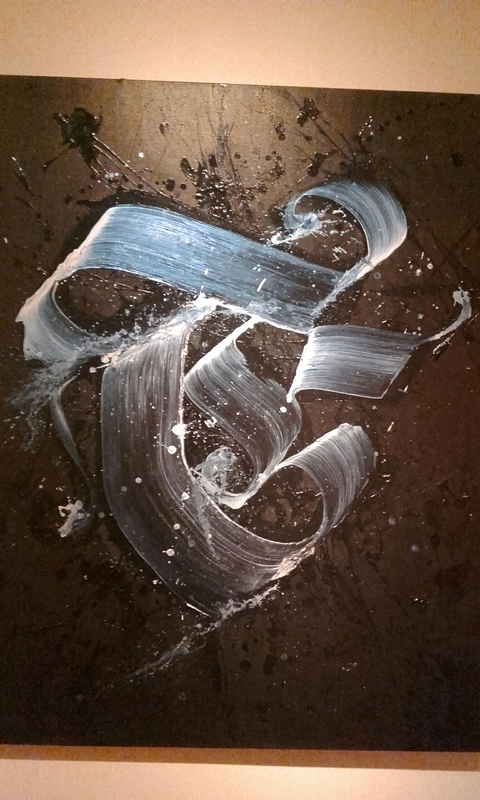 This monumental occasion would serve to hone the skills of both sets of artists, which culminated in a new wave of refined graffiti, nominally an oxymoron. 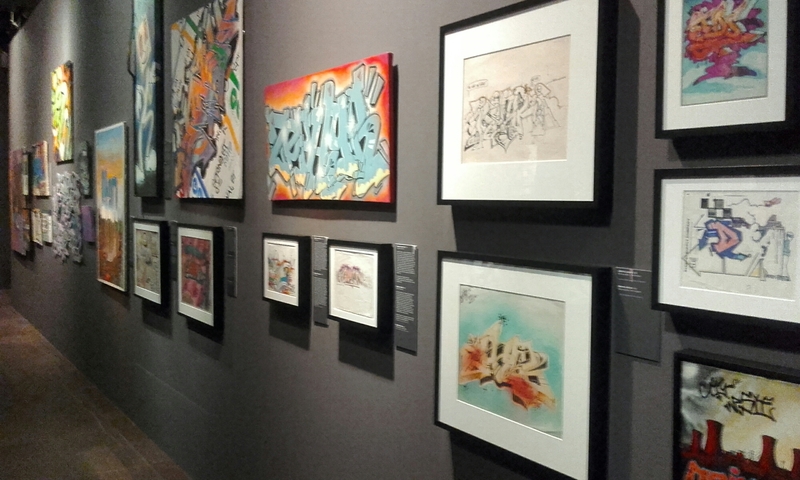 Wandering through the sizably large gallery served as evidence of this, and I was pleasantly surprised at what I saw. 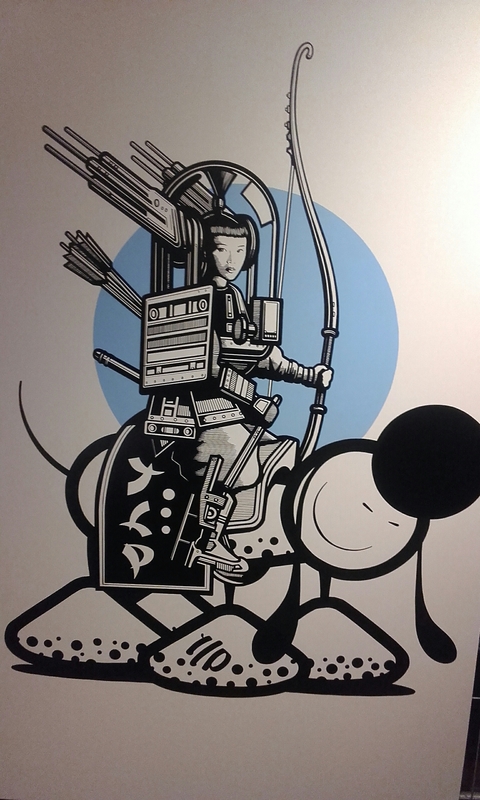 I also learned that a Chinese-American by the name of Melvin Wong established a gallery in the 90’s to collect the best ones, attesting to the power graffiti had. Taking things a step further, the best street artists were invited and sponsored to draw on canvases; this was initiated to ensure their legacies would be preserved. Honestly, some paintings would not look one iota out of place in modern art galleries-they were that fantastic! If you ever tire of older art, I cannot recommend this exhibition enough! I spent an intriguing 90 minutes there, but it was time to move on. Back at the hostel, the staff had mentioned an excellent brewery towards the eastern parts of the city. There were two things that made this a must visit: 1. The beers served were uniquely Dutch-you cannot find them outside the country, and 2. The brewery was in an old windmill! The walk to Brouwerij ‘Tij took about 40 minutes (20 to get back from the center and another 20 from the hostel), but it was worth it! Lord knows I earned my beers from the walk, but the immediate comfort of nice craft beer helped give me a second wind. To describe the atmosphere there, just imagine seeing the vats to the left as you walked in, walls covered in empty bottles representing hundreds of craft beers from around the world, and the bar smack dab in the middle. If you are an aficionado of beer, this was an oasis of heaven. Each beer costed €2.50 (about $3), which is a bargain in Amsterdam! About an hour later, I made my way back, still pleasantly buzzed. This was the way I wanted to spend my last day in this incredible city, and I got my money’s worth! Note: the Brouwerij ‘Tij has tours, but only F-Su. It also opens it doors starting at 2 every day, so plan accordingly.